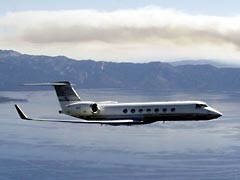 Soulja Boy's all over the news today for buying himself a $55 million Gulfstream G5 jet for his 21st birthday. Well the jet itself only cost $35 mil, according to "a member of Soulja's management team," with the remainder going towards customizing its interior, including what TMZ sort of strangely emphasizes is "a giant, LUXURIOUS bathroom." He's also throwing himself a $300,000 party in Miami because what, he's not going to throw himself a $300,000 party for his 21st birthday? Get serious. My internal class warrior of course seethes at the news (and has in fact long been tempted to hack into his bank accounts and give all of his money away to charity) but it fits in with how insane Soulja Boy's career has been. It also gives me a reason to post the video (after the jump) for the special birthday boy's song "Louis Vuitton" which may well be the best rap song in the world right now, and which puts me in the unexpected position of thinking that Soulja Boy might be a complete genius after all. At the time when "Crank That (Soulja Boy)" exploded I had a DJ residency at a bar that tended to attract a lot of the post-frat douchebags who were in the process of ruining Wicker Park, and they expected to hear all of the hits, and I can attest to the fact that even after playing that song several hundred times I never got tired of it. Given how unbelievably vapid Soulja Boy's lyrics were I assumed he'd probably just stumbled upon the perfect formula for a dance-floor-crushing anthem and that after "Crank That" cycled out of taste that we'd never hear from him again. But it turns out that he has a serious talent for putting together hooks that make the leap to ubiquity seem effortless. Even if you never once played "Pretty Boy Swag" on purpose you've heard it probably hundreds of times, from passing cars or on the bus courtesy of a tinnily blaring cellphone or any of the thousand ways that song's been cranked into the environment. Recently he's fallen in with Lil B, erstwhile member of the Bay Area rap group the Pack (of "Vans Song" fame), whose sonically adventurous solo effort have found the same weird cultish popularity amongst teenagers and music critics as Odd Future, and who seems to have had some effect on Soulja Boy's creative vision. Add in the nagging, vaguely Eastern-ish vocal melody on the hook and the druggy delivery of it and you've got something that's totally fascinating and defies easy categorization, or at least with the categories that we have at the moment. Which is more or less the hallmark of genius. He's still blowing my mind, though.